If you know how to use the verb to be, you can get by in English with only a few more verbs. Without it, you really can’t speak English at all! It isn’t too difficult to learn (though most other verbs are easier.) You just need to learn a few forms well. It’s worth it! We use it far more than any other verb . They are= they’re; they are not= they’re not or they aren’t. · I’m going to the store now. · Jim isn’t studying; he’s thinking about his girlfriend. · They’re celebrating their one month anniversary. 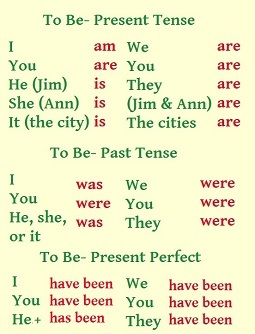 The past continuous tense works like the present continuous, except it uses past forms of be. (See examples under Past Tense.) It is most often used to talk about something that happened over a period of time, especially in contrast to another event that happened suddenly. · You can be anything you want to be. · Could you be quieter, please? The baby’s sleeping. · I would like (usually: I’d like) to be a grandmother someday. · That bully should be ashamed of himself. Can’t he be nicer to little kids? · Dad, may I please be excused? · He might be interested in your offer; I don’t really know. · Are your parents going to visit you this year? I will definitely be anxious to see them. · They’ll be coming to see us next month, but they won’t be with us for very long. · We’ll be saying good-bye less than a week after they arrive, because they’re going to visit my sister’s and brother’s families too. I was returning home when there was an earthquake near here. What were you doing when the earthquake hit? Weren’t you scared? I was, and my dog was so scared she whined for half an hour! Our daughter was a student in 2006. We were hoping to visit you, but it wasn’t possible. Dan and Debbie were tired after their trip. Although they had been sleeping well, they were glad they had the weekend to rest some more. Pay attention to how many times you hear or read some form of the verb ‘to be.’ I would guess you can’t go more than a minute or two without finding it-- probably more than twice. Home> English Verb Tenses> The Verb to Be.